Background: Introducing new candidates for various biological targets is a prime characteristic of the present day medicinal research and development. Guanidines are the important bioactive compounds and are well recognized for their diverse biological activities, especially as anticancer, antimicrobial and antioxidant agents. Due to the favorable electronic properties of ferrocene like lipophilicity, redox activity, stability in solution state and its easy derivatization, have made ferrocenyl compounds very popular molecules for biological uses. Objectives: Keeping in sight, it is valuable to synthesize ferrocenyl guanidines to increase the binding potency with DNA, make them redox active and more lipophilic compounds. Methods: Six new ferrocenyl phenylguanidines (F1 – F6) have been synthesized via multi step protocol. The structures of F1 – F6 were established by using elemental analysis, UV-visible, multinuclear (1H and 13C) NMR and FTIR spectroscopy. Solution phase redox behavior, of the synthesized compounds, has been characterized by cyclic voltammetry. Two compounds (F2 & F4) were characterized by single crystal XRD. 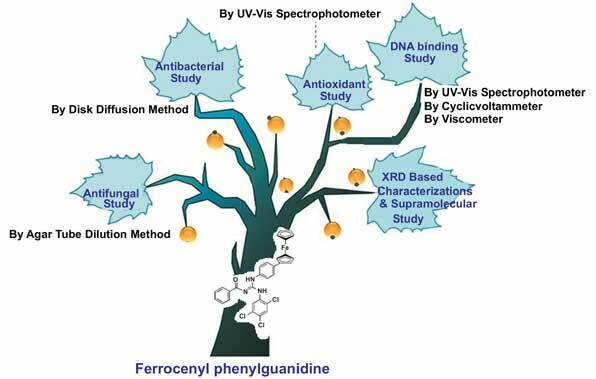 Results: Due to the biological importance of guanidines; these ferrocenyl guanidiens were screened for different biological activities like antibacterial, antifungal, antioxidant and DNA binding. DNA interaction study was done by using UV-visible spectrometry and cyclic voltammetry revealed good binding capacity of the test compounds. Conclusion: The results revealed that the ferrocene incorporation to guanidines enhances their DNA binding ability. A similar trend was found in antioxidant and antimicrobial studies. Being the bioactive molecules these compounds are potential drug candidates. Synthesis, crystal structure, DNA binding, antioxidant activity, antifungal activity, antibacterial activity. Department of Chemistry, University of Gujrat, Hafiz Hayat Campus, Gujrat 50700, Pakistan., Department of Chemistry, Quaid-i-Azam University, Islamabad 44000, Pakistan.